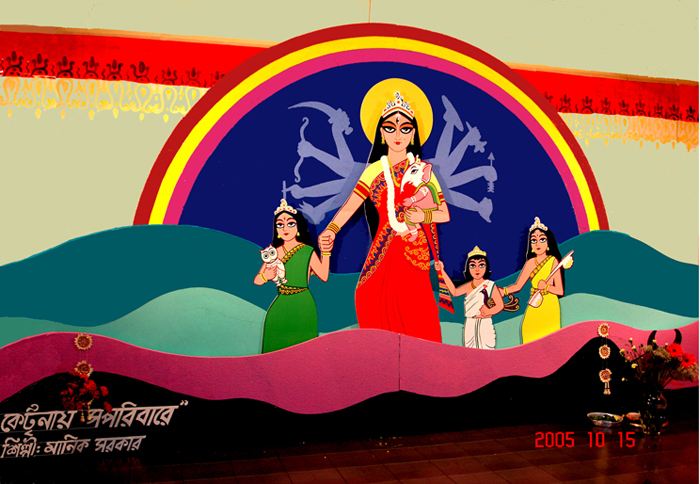 "At Katrina With the Whole Family"
In the year 2005, for the annual worshiping ceremony at Milonee, the Bengali association of Colorado, Manick Sorcar painted the image of Goddess Durga in a new avatar. Goddess Durga in Hindu mythology symbolizes good over evil. The Hindus believe that she visits once every year with her family and a continuous ten days are celebrated to welcome her. This was the year when hurricane Katrina had devastated New Orleans, Louisiana, USA, and the neighboring areas. In this image Goddess Durga is carrying her son, baby Ganesha, in her arms in deep waters with her children. She is here to share the grief and to bring hope, symbolized by the rainbow.